I know it is still National Crochet Month, though according to some folks it is National Crafting Month. 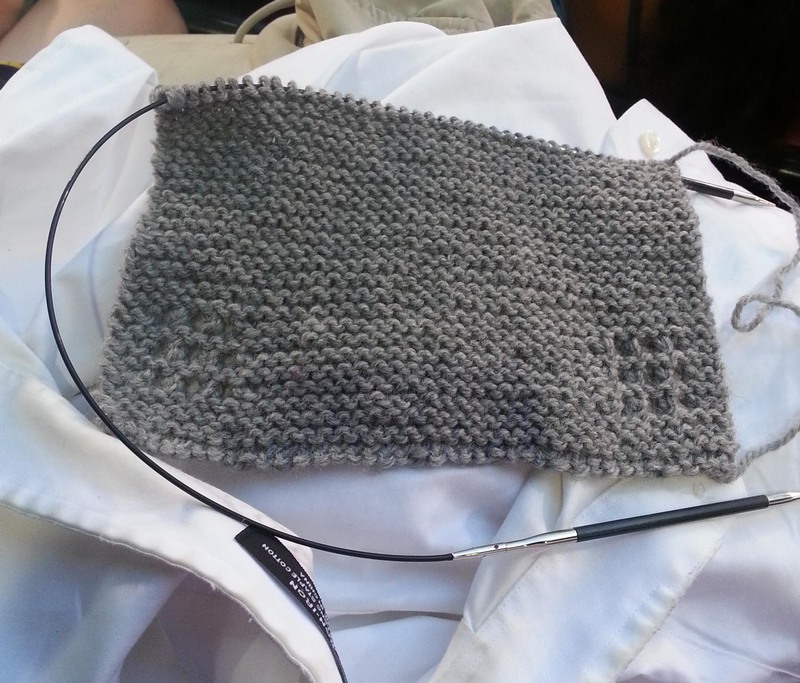 I thought it would be fun to talk about that other popular yarn craft: Knitting. 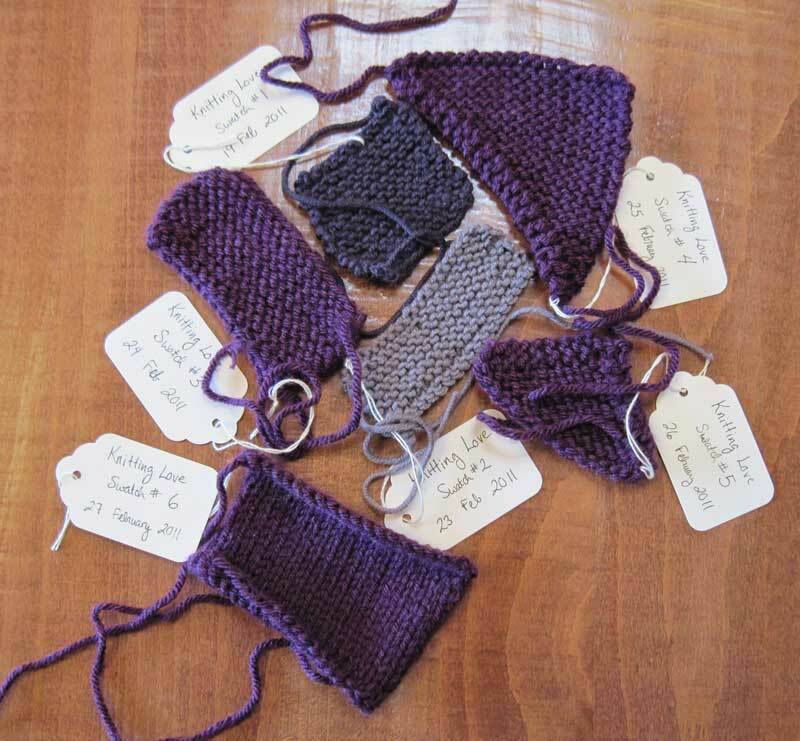 My swatches from my 2011 knitting experiment. The funny thing is I was wondering this week what I was blogging about 5 years ago in March. Turns out I was experimenting with knitting. I hadn’t really gotten the hang of continental style knitting and I was a very slow knitter. Not to mention easily frustrated with my knitting. Amazingly enough I have actually gotten a lot better at knitting the past 5 years. 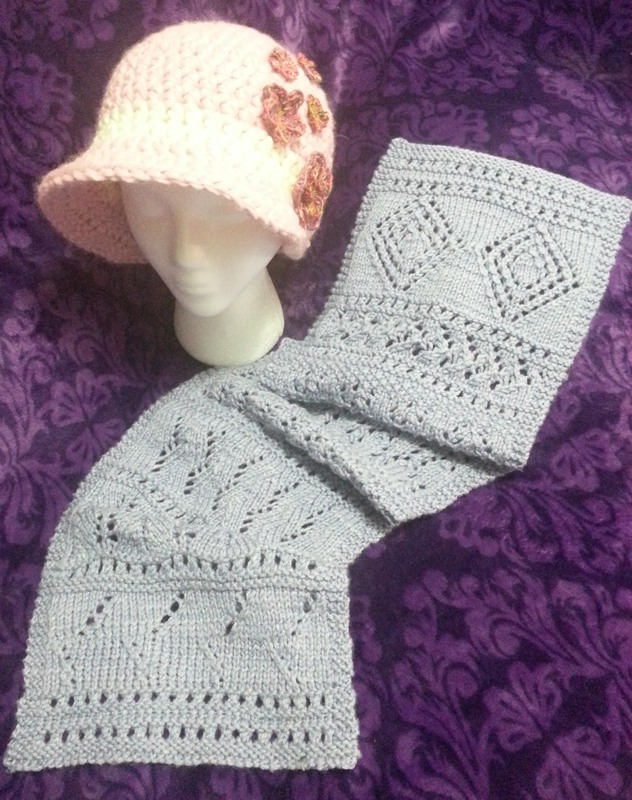 I have to say that taking a class with Galina Khmeleva at the 2014 Knit and Crochet Show was a definite turning point for my knitting. It even made me bold enough to take a lace knitting class at my local yarn shop: Longmont Yarn Shoppe. I made this pretty scarf. It’s not perfect, but I learnt so much working thru it. Reading back over those 5 year old posts, one of the things I remembered was how stressful it was for me trying to understand the stitches. Now I can finally really see the stitches and I know when they are on my needle correctly and even better I know how to fix them when they aren’t. Beginning of my son’s Christmas Scarf. I knit a scarf for my oldest son for this past Christmas. Unfortunately I didn’t get a photo of it when it was finished because of the usual mayhem at Christmas-time around our house. He has worn it almost every single day this winter, so I think he likes it. Unfortunately it is beginning to show that it well loved. A bit like the Velveteen Rabbit. I’ve been thinking about attempting to design a pattern using simple knitting and elaborate crochet, but it keeps slipping down my list of projects. Will have to see if I can get on it later this year. I still don’t knit all that much and crochet is my first passion when it comes to playing with yarn, but I am glad that I understand how to knit. If nothing else going thru the pain of learning and being in that beginner’s mind again has made me an even more compassionate teacher. This weekend begins Spring Break for my boys, so I may be a bit quieter than usual. I hope to have something exciting for all of you next week, though it may be next weekend.